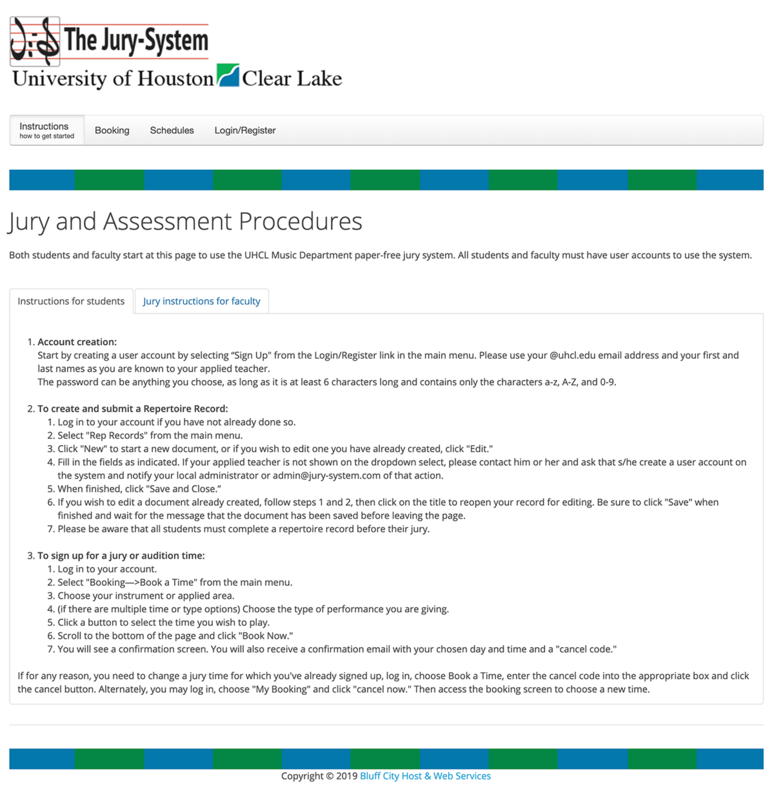 The Jury-System™; is the efficient, paperless and painless way of organizing, scheduling and evaluating music student applied lesson juries. 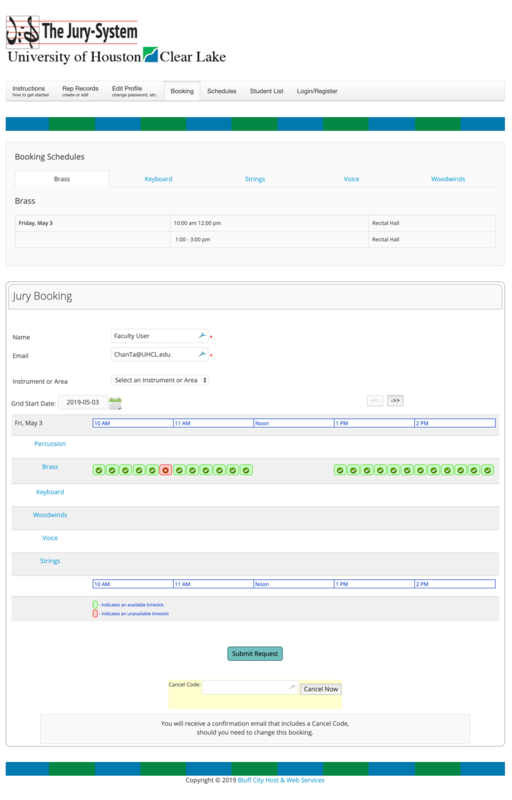 The Jury-System™ makes the entire process faster, easier and less stressful for all concerned by integrating all aspects of the jury process — repertoire record creation, scheduling, evaluation, and distribution and storage of results — into a single online application. All repertoire records, evaluation forms and jury schedules are customized for each client. In addition to the instant email notifications, the results are stored in the site's database and can be extracted in a variety of formats, making data gathering and analysis for assessment a snap. Clients may also choose to use the scheduling component for ensemble auditions. Now with Single Sign-On (SSO)! The Jury-System™ can be integrated with your school's institutional login for automatic account creation with appropriate access levels, and without the need to remember yet another username and password. This also enhances site security. Available from any computer or tablet — any time, anywhere there's internet access. Subscription based — there's nothing to buy, install or maintain. 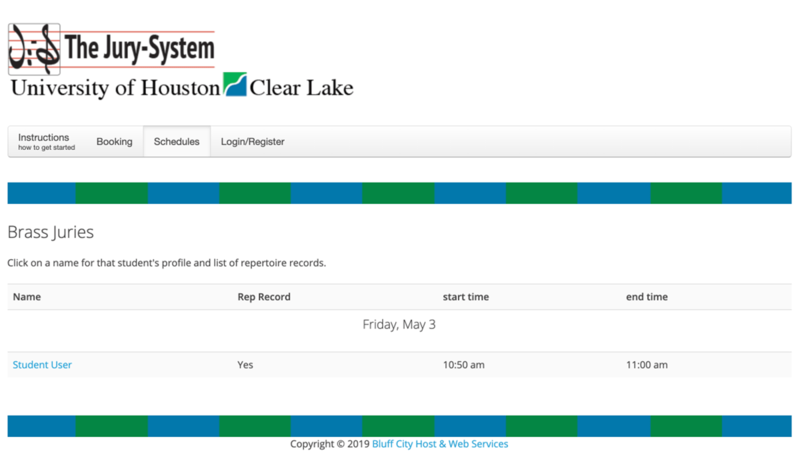 Customizable — choose from pre-made repertoire record and evaluation forms, or forms can be tailored to suit individual clients. Comments can be sent to students or only to their professors, or to both. Fast and efficient — jury comments and grades are emailed instantly to participants and saved in the client's private database. Flexible — In addition to easy text entry, evaluation forms allow jurors to insert musical and International Phonetic Alphabet symbols. Productive — jury results can be exported in a variety of formats for assessment purposes. Popular — thousands of students and their professors at music schools from coast to coast currently use The Jury-System. Students schedule their juries using another online form. They can easily cancel and rebook if necessary. Each appliead area has its own schedule page. Clciking on the student's name brings up their repertoire record and evaluation form. Students fill out a web form to create their repertorie record. Fields are customized to the client's specifications. Jurors see the repertoire record and evaluation form together. Evaluation criteria, rubrics and grading are all customzied to client's specifications.